Note that the design studio influences all three points. As a result, we’re big fans. This year, one of the goals of the Salesforce UX team was to increase our influence at an organizational level. Like many organizations, our execs were asking how the company can be more innovative and they were looking to the UX team for help. Rather than working in isolation and hoping that we stumble upon some brilliant idea, we decided to get everyone involved. We knew there were probably dozens of great ideas locked in people’s heads, they just needed a venue to share them. The design studio had been such a success at the individual team level, we thought maybe we could scale it up to accommodate an organization. We would involve our entire products and technology team of several hundred people rather than the typical 6-10 participants. We also wanted to tweak the structure a bit to focus on surfacing innovative ideas that we knew were already out there. If you’re going to rally an entire organization to participate in an event, you need an executive sponsor. Our executive sponsor was highly supportive. He personally sent the event invitation and committed to attending in person. More importantly, he provided a broad executive audience to review the best ideas and consider them for funding. We felt strongly that these ideas needed a chance to become real projects. It’s hard to build momentum without a brand. We chose the name Cloudburst which felt a little silly at first but really helped people identify the event. The brand allowed us to produce promotional material such as posters, t-shirts and the like in order to increase awareness. Plus, if we were successful, we wanted a recognizable brand that could live on for the next event. The primary purpose of this event was to surface innovative ideas. This meant that our scope needed to be fairly broad. A typical design studio explores one or two use cases. For this event, nearly any idea was fair game as long as it aligned with our company goals. In order to keep everyone motivated we decided to structure the event as a friendly competition. Participants were asked to form teams of no more than three to maximize collaboration. Teams would work with pen and paper only and ideas would be judged on the following criteria: Creativity, Simplicity and Fun. In the weeks leading up to the event, we set expectations and built excitement. 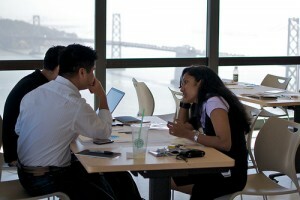 Participants were welcome to bring ideas that they may have already had brewing. This event would provide them the opportunity to give their idea executive exposure. If they didn’t have an idea, no problem! They could help develop someone else’s. What problem are you solving? Who are you solving it for? How will their lives be improved as a result of delivering this product? We provided each team with personas to help guide their work. The UX team canvassed the floor, reminding teams to tell a story from the perspective of their persona and asking probing questions to help flesh out their concepts. Computers were not allowed. Just minds, pens and paper. This forced the teams to communicate verbally and visually, which is exactly what we wanted. Teams spent the bulk of their time collaboratively sketching. 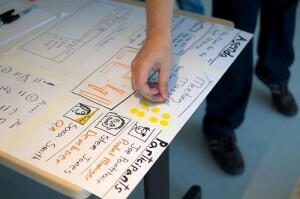 At the end of the day, teams would have only two minutes to pitch their idea using a single sketch board for illustrative purposes. These constraints forced teams to really nail down their narrative. They had to take all of their sketches and consolidate them into one rapid-fire pitch that would help them sell their ideas to peers and executives. After all the pitches were heard, participants dot-voted on each other’s ideas. Three finalists were chosen from the group and moved on to the next round: pitching to executives. 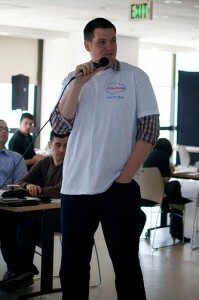 After finalists were chosen, they were given a few weeks to refine their ideas and pitch to the entire executive staff. One winning team was chosen and their idea is now planned for development. The executive pitches were a huge hit. Execs were wowed by the ideas generated and the level of energy and enthusiasm from both participants and executives was amazing. The execs were so impressed with the outcome that they immediately asked, “how can we apply this process to other aspects of our business?” We have since conducted similar events in the Marketing organization and with our customers and we’re planning more events in 2011. Logistics are a challenge with such a large group. Planning and running these sessions is a huge undertaking, so make sure you are ready to commit the time and resources to make it successful. Some participants were uncomfortable with the dot-voting and felt that the group lost sight of the original judging criteria. We are considering electing a panel of judges for future events as well as providing more categories for winners such as best presentation or most creative idea. The vast majority of ideas will not get funded. Make sure you have an outlet for the ideas that people are really passionate about. At Salesforce we have a program called PTOn which is very similar to Google’s 20% time. Employees can use this time to pursue ideas they are passionate about. The concept may be too popular! We were flooded with requests to host more of these events. The problem, as mentioned earlier, is that they are very resource intensive. There is also the risk of participant fatigue. We think that 2 to 3 events of this size per year, within an organization, is the maximum. 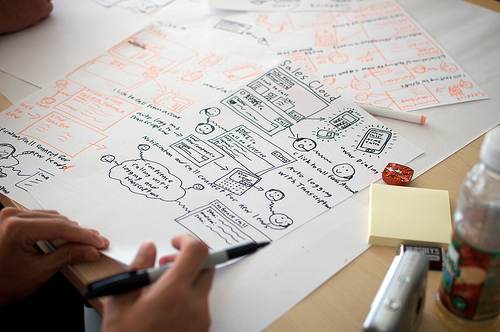 Good designers generate great ideas; great designers generate change. Talking and drawing are very important. I think this is a key element to creating trust, understanding and shared vision. 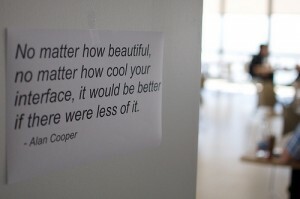 Love the pictures, great post! Thanks, Lane! I agree. Shared experience and shared vision are very powerful and can really energize an organization. Thanks for describing the process in such helpful detail, Craig. Sounds like a great time. Have you brainstormed other ways of conducting the voting? In such a large group there might be other mechanisms that work better, to help people sift quickly to pick the likely best, and then put more thinking into how they would rank those according to the selection criteria. Thanks Moses. Yes, we are looking for better voting mechanisms as this seemed to be one of the areas that needed the most improvement. So far, we’ve been considering having a panel of judges that would explicitly use the defined criteria. Of course, the downside of that is that the group doesn’t get to have a vote (except perhaps for a simple most popular idea vote). I’d definitely be interested in exploring ideas that would allow us to keep the group in the voting process. If there are any methods you can point me to that you think would be more effective, please do! Thanks for the comments, Moses. We recently held our second one of these at Salesforce and we used a judging panel for several categories as well as a secret ballot for our participants to select the “People’s Choice Award.” This allowed us to make sure the panel of experts would vote for the appropriate judging criteria while the masses would help determine a group favorite like the first event, except not publicly. Another option is to create a Google form linked to a spreadsheet that only you have access to (to tally the results). This option unfortunately requires a bit more overhead and it’s harder to ensure that only people who heard the presentations get to vote. The judging panel + secret ballot wound up being a success so I recommend that route. Thanks for a great post, Craig. I’m interested if the concepts were archived/shared after the events? Thanks, Johanna! Yes, all of the pitches were captured on video and photos were taken of the sketches. These items were then shared using Salesforce Chatter, our enterprise social collaboration product, where people could post comments and follow-on questions. Yes, the videos are very popular. I’ve also had teams request their original poster boards. They have actually taken them to meetings and re-pitched their ideas to other project managers, execs, etc. I couldn’t agree more with the 3 bullets at the beginning of the post. For what it’s worth, one thing I’ve experienced great success with is a short phase of root cause analysis on the problem being worked on, just prior to design studio type activities. This would be a facilitated process that includes the entire team. I’ve found that proving why the problem is a real problem by finding “root causes” enables teams to more easily come up with great ideas and it also helps in the selection of a solution to proceed with. Most importantly, people often find details that weren’t thought of in the original problem/story, which can often prove critical to a really great solution. For this sort of thing, I generally just mind map out the responses that I get to questions about the problem. I then ask questions about those responses and map out the answers to that and keep going until we hit that “AH HAH” moment, or discover we were going down the wrong rabbit hole. I’m always surprised by what comes out of actually mapping a thought process in this way, and it goes a long way for creating a shared understanding of the problem space. Thanks, Alan. I like the approach you have outlined here. Problem definition is so crucial to making design studios worthwhile. I’ve often found that some crucial bits of information get uncovered or new and important questions raised in preparation for the design studio. I like the idea of including the team in this phase as well.